Just wanted to show everyone the deck we are currently working on, which is located in a bean and corn field. We are calling it the gun deck since it is for the purpose of shooting from. As you can see in this photo, a central feature is the gazebo. 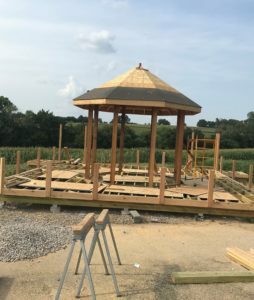 In the middle of it will be a fire pit, with benches around the inside of the gazebo. The taller posts at the far end are going to be gun cages. The little platforms at the far corners will be the launching pads for the targets. Right now we are putting the final touches on the framework so we can begin installing the decking. What you can’t see are the 42 footings we poured before we able to begin building the frame. In case you were wondering the deck is over 900 square feet making it the largest deck we have built to date. Keep checking back as we will be updating as we go along, also watch for videos we do from time to time.